Once again, Salesian Missions has launched our dedicated Food Distribution Appeal — an annual campaign, inspired by Thanksgiving’s bounty, which raises the funds required to deliver nutritional food to children and families in desperate need. This year especially, we depend on the participation of compassionate friends like you to help us conquer world hunger. After a period of encouraging decline, world hunger is again on the rise — a fact that our Salesian missionaries on the ground witness every day. According to official estimates, 815 million people suffer from chronic undernourishment and the effects are heartbreaking, especially for the young. Every year, millions of precious girls and boys die from hunger. Malnourished children who survive suffer from stunted growth which leads to cognitive delays and health issues that contribute to an inescapable cycle of generational poverty. Fifteen-year-old Joseph easily could have fallen into this trap, through no fault of his own. Joseph lives in Lungi, Sierra Leone — a profoundly poor coastal community in the northern part of the country. For him, hunger was a double-edged sword; it both interfered with his ability to learn, and — because his parents couldn’t afford to feed him — it forced him to find work in order to pay for something to eat. This meant time away from his studies, and from participating in skills-building activities such as soccer. Fortunately, thanks to an ongoing partnership with Feed My Starving Children, a nonprofit Christian organization committed to “feeding God’s children hungry in body and spirit,” Joseph now receives crucial food assistance through a school-based feeding program run by Salesian missionaries at the Don Bosco Youth Center. 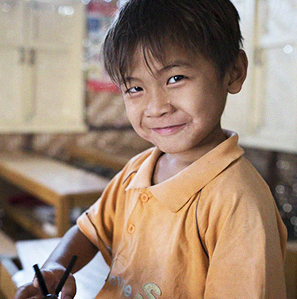 Each week, he — and hundreds of his peers — receive fortified meals that ease his gnawing hunger and keep him healthy. Generously donated by Feed My Starving Children, these meals arrive in Lungi in shipping containers arranged by Salesian Missions. Funds raised during the Food Distribution Appeal help cover the costs of shipping the containers, and transporting the food goods to their final destinations. According to Salesians in Lungi, demand for these feeding programs is at an all-time high. And it’s a trend mirrored in countless impoverished communities around the world where our missionaries serve. This is why Salesian Missions cultivates relationships with leading relief agencies like Feed My Starving Children. Since 2006, when the organization first donated a container of meals for Salesian-run programs in Sri Lanka, thousands of children and their families have received critical food aid. 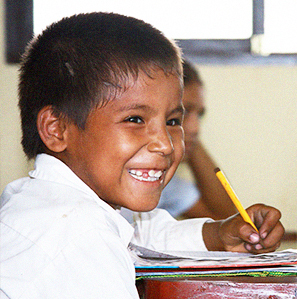 Missionaries combine this aid with school-based programs and other social projects to ensure holistic support for the hungry people they serve. For every child like Joseph, however, so many more pray for nourishment of their own. For just a few dollars in support of our annual Food Distribution Appeal, you can help us answer their pleas for help. Our mission transforms every $1 you give into $20 of life-saving food. Please join us in this miracle today!